The human weakness for mayhem and murder has been a consistent source for profit through the ages, a fact well known to the arms industry behind today’s National Rifle Association. Armories of Germany, Britain, France, Belgium, Russia and the United States at the end of the 19th century produced versions of the “Maxim Gun,” referred to as the “Devil’s Paintbrush” due to its use in conflict since the original 1883 patent by its inventor, Hiram Maxim: “In 1882 I was in Vienna, where I met an American whom I had known in the States. He said, ‘Hang your chemistry and electricity! If you want to make a pile of money, invent something that will enable these Europeans to cut each others’ throats with greater facility.’” Ninety percent of those felled in the battlefields of WWI from bullet-related injuries died from Maxims and clones employed in that war. Similar numbers succumbed in WWII and subsequent wars from land and airlaunched ordnance fired at a rate of 600 rounds per minute and higher. Sprayed ordnance at up to 1,200 rounds per minute is available from the muzzle of the Glock 18, a 2-pound gun that occupies the space within a lady’s handbag. Trust the NRA, its network of craven politicians and infotainment jockeys to make such toys available to whomever wants one — presently available only to our increasingly militarized police forces — but stay tuned! Imagine the result of a suspected attack inside a darkened theater answered by vigilantes in the audience with fire, the walls echoing from all directions and lit cell phone screens confused with muzzle flashes — enough body bags for the outcome? 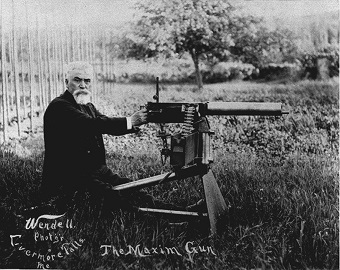 Back to the NRA and its sponsors — Sir Basil Zaharoff, the most notorious arms dealer of all time, was known as the “Merchant of Death.” I’m sure he wouldn’t mind sharing the honor.